Brigadier General DeWitt S. Spain. He was the Commander, 10th TRW, RAF Alconbury before Colonel James Kemp. General Spain may have died of cancer. DeWitt Spain was born in 1919 and died in 1969. While there is a small airport in Memphis, Tennessee, named for him, we can find no biograpical information within the United States Air Force biographies section. 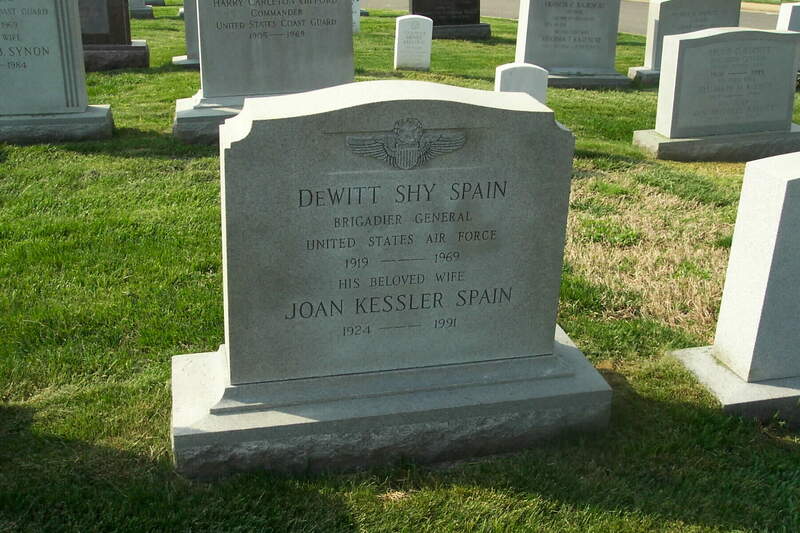 The General's wife, Joan Kessler Spain (1924-1991) is buried with him. If you have information regarding the General and/or his wife, please contact the Webmaster. Brigadier General Dewitt S. Spain did not have a biography on file with either the Air Force Historical Research Agency or the Air Force Office of Press and Information (later Air Force Public Affairs). So, we don't have any information him. All that I found on the Internet was that he was a B-66 pilot and commanded RAF Alconbury. He may have opted to not furnish a biography when he was in service or he may have retired as a Reserve general officer (only active-duty retired officers are listed). We've placed more than 2,000 historical biographies on Air Force Link. If we don't have it, there's a good reason. Sorry we were unable to help.